Soorma tells the story of the international hockey player Sandeep Singh, played by Diljit Dosanjh, who was paralyzed and used a wheelchair for two years after an accidental gunshot injured him in 2006. 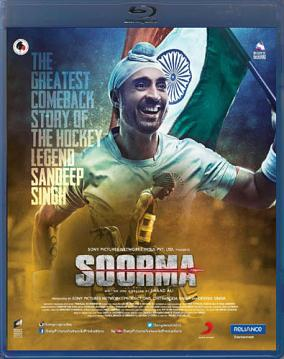 The film’s tagline is "The Greatest Comeback Story of the Hockey Legend Sandeep Singh". Fighting against all odds, Sandeep got back on his feet and made a comeback to international hockey in 2008. India won the 2009 Sultan Azlan Shah Cup under his captaincy and went on to qualify for the 2012 Olympics. The story also mentions the contribution of his brother in his life who stood like a pillar of constant support during these hard times and also shows his girlfriend who left him, so that he would be able to focus on recovering and doing well for himself. Buy Soorma Hindi Film Blu Ray Diljit Dosanjh, sold & shipped by Movie Time Video where you can shop online for Pooja Mandir, Bajot, Gifts, Hindi Movie DVD / CD, Music Video. This Hindi Movies collection has been tagged as family drama, hindi movie dvd, sports film, legend star, true story cinema.